In Indonesia, the events of 1st October 1965 were followed by a campaign to annihilate the Communist Party and its alleged sympathisers. It resulted in the murder of an estimate of one million people – a genocide that counts as one of the largest mass murders after WWII – and the incarceration of another million, many of them for a decade or more without any legal process. This drive was justified and enabled by a propaganda campaign in which communists were painted as atheist, hypersexual, amoral and intent to destroy the nation. To date, the effects of this campaign are still felt, and the victims are denied the right of association and freedom of speech. This book presents the history of the genocide and propaganda campaign and the process towards the International People’s Tribunal on 1965 crimes against humanity in Indonesia (IPT 1965), which was held in November 2015 in The Hague, The Netherlands. The authors, an Indonesian Human Rights lawyer and a Dutch academic examine this unique event, which for the first time brings these crimes before an international court, and its verdict. They single out the campaign of hate propaganda as it provided the incitement to kill so many Indonesians and why this propaganda campaign is effective to this day. 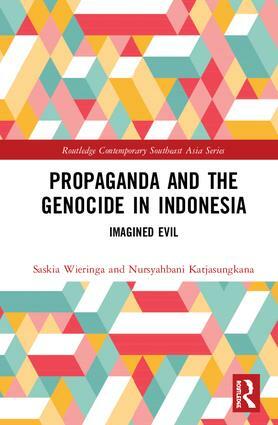 The first book on this topic, it fills a significant gap in Asian Studies and Genocide Studies. Preface 1.Propaganda in Indonesian history: introducing the theme 2. Unanswered questions about the G30S Movement 3. The International People’s Tribunal on the 1965 Crimes against humanity in Indonesia 4. The nation betrayed: history revisited 5. Rural unrest, religion, culture and the Pancasila 6. Women’s degradation and homophobia; two sexual moral panics 7. The complicity of the middle classes 8. Transitional justice and memory work 9. New Style Communism? Saskia E. Wieringa is a professor at the University of Amsterdam, Netherlands, and the Chair of the Foundation IPT 1965 which established a People&rsquo;s Tribunal on the post-1965 crimes against humanity perpetrated in Indonesia. Nursyahbani Katjasungkana is a human rights lawyer and the national coordinator for the Indonesian Women's Association of Justice. She was previously the Director of the Jakarta Legal Aid Institute, Indonesia and is presently the chair of its Board, She is the general coordinator of the Foundation IPT 1965.